hiking zion national park with the kids! since we’re in utah, we drove down to zion national park on friday night with big plans for a sunrise hike the next morning. but in typical davis family fashion, we didn’t get out of our hotel room and onto the road to the trail until 10am. but actually, in all honesty, high fives for getting on the road AT 10am and not later. the important part is that we successfully hiked what we came to hike, there were minimal tears (considering samson accidentally scraped his knee towards the end) and eleanor even declared that her new favorite activity to do is going on hikes! we wanted to do angels landing, but because i am so nervous around cliffs and drop offs and we have three little ones and only two of us (and two carriers to carry them in when they are tired), we opted for doing the canyon overlook trail instead, which is just a mile long and while there are drop offs, it felt a little more manageable with the kiddos. that awkward moment when your little one sticks his hand down your shirt because he wants milk! finding the spring source and following the water trail! the angle is deceiving, but i am no where near the edge of the cliff! i promise! chasing lizards! do you see it?! this is what i’m talking about when i say the details in the desert are just so good!!! a new balance tennis shoe family. haha! eleanor actually was the one who pointed out we all had N’s on our shoes! success for team davis! the best time, honestly. i would love to get more hikes into our future. let’s do this! work out top (love THIS COLOR option, too. and HERE is the sports bra version), work out pants (old, but similar style HERE), sneakers and sunglasses. kids sneakers HERE and HERE. eleanor’s watermelon bucket hat HERE. and using ergo carriers for the kids (five years later and it’s still our favorite carrier!) also, HERE is a tutorial i put together a few years ago on how i do my hair like that. Nature is an incredible source of inspiration to me! It always leave me speechless. You and your family look so sweet and like you’ve totally enjoyed the hiking! What an amazing view!! I am heading to the states this summer and Zion is super high on my bucket list!! Hope I get to make it there is looks so unreal. How amazing are these picture? It looks like a wonderful day and I agree with Eleanor, hikes are the best! This is me laughing at the idea of me in a shelf bra. LOL! those are amazing pictures!!! love them! I was wondering if you could somewhen make a post about your workout schedule and what you are doing to keep fit, you look so beautifully toned! Such a gorgeous family! I LOVE that you have no qualms about nursing in public. I nursed my two just about everywhere as well. It took me some years to start to appreciate the beauty of the desert as well. That red rock desert is so very striking, though! (We went to Arches Nat Park last year for spring break and fell in love.) And I totally get it about those tricky angles. So many times (especially at Delicate Arch,) I was in a near panic thinking my kids were going to fall off into an abyss when actually, the ground was much less dangerous than one viewpoint showed it. Zions is definitely on my list. Love these photos! I think as we get older, and have our own family we begin to appreciate the beauty of the earth no matter where we live, especially when we go back and visit our home state. I know for me I feel the same way, and although I love the east coast, looking at your photos makes me long for some desert in my life, and much needed warm weather. I’m a texas girl at heart and don’t mind summer, and living in different states has made me and my kids appreciate all the places we’ve gone. So glad you’re traveling with the kids while they are little! Have a great week! These photos are so great! You have a lovely family. Just a note of thanks for sharing photos of you nursing. It has given me confidence to nurse my first all around the city – I always think of you doing it! Thank you for being a positive role model for this first time mom. I’m with everyone else! Please a post on working out/toning! uhm, please tell me my body will look like that after having 1+ kids??? truly fun, these memories + pictures are going to be cherished, i’m sure. I LOVE the desert! We get nothing like this in the UK, so whenever I’m lucky enough to visit our family in Phoenix we always love the scenery of the desert so much! We actually planned on visiting Zion on a little stopover from Vegas to Page, but unfortunately, we visited a few years ago when the government shutdown was on so all the NP’s were shut! It looks absolutely stunning though – I’m glad you guys enjoyed it! I can’t get over how much your kids enjoyed it too – that would have been my idea of torture when I was a kid haha! Wow, those views are amazing! I can’t say I’m much of a fitness buff myself but I recently went hiking in Scotland and it was totally worth it for the views! Also, I’m dying over Josh’s socks all pulled up – definitely nailing the dad style there ;) Such a beautiful family! Gorgeous photos! What camera are you holding to video (I assume). Do you not use the 6D to video? Save Angel’s Landing for when they’re teenagers! There are several deaths a year attributed to that hike. It terrifies me! Gorgeous pictures though. We love Zion’s. 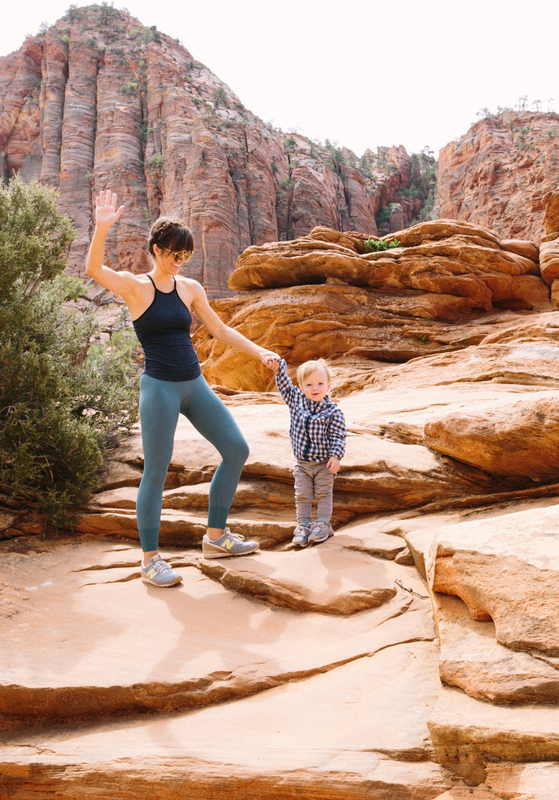 I hiked Angel’s Landing whilst 5 months pregnant–you’re right, I definitely would not hike it with kids (or especially once I had kids at home I would potentially leave motherless). It is not for the faint of heart — people have died trying to hike it all the way to the summit. Naomi you’re looking absolutely beautiful! What are you doing at that gym? Please let us know! My husband and I were just there with no kids and we were planning to finish the Angels landing hike until we got to scouts landing and not only ran out of water but stopped dead in our tracks when we saw the last leg of the hike with the chains and crowd of people. I read so many reviews for that trail and nothing had prepared me for how strenuous it actually was AND WE DIDN’T EVEN FINISH haha! I wish we would have done this home instead. I was born and raised on the West Coast, with an Aunt near there and have YET to go. My husband keeps telling me I am missing out. When I beat my illness, I hope to get there. It looks beautiful (but tiring!). You have endless energy and are such an inspiration!!!!! what a gorgeous hike! you are making me want to visit the desert asap! I love how you warn us that you’re not near the edge. I agree that the angle of the camera can be deceiving. I love the fun things you do as a fam! I’m a Utah girl and love the red rock! But we just went to St George this last weekend and I always think how we don’t take advantage nearly enough. It is so pretty and there are so many ways to enjoy it, even with kiddos in tow. As we spent the 5 hours driving home, I just kept thinking how I couldn’t imagine living somewhere else that didn’t have mountains and beautiful scenery like Utah does. 1) Those views are seriously gorgeous! I also have never really thought much about the desert, but seriously, it looks like a fake backdrop! 2) I second the other comments on sharing your workout routine! I know it might feel weird, but I might feel more inspired to lift some dumbbells if I knew my arms would look anything like that! Way to go! love the colors and your stunning body Naomi! You body looks stunning, what have you done to get back your danseuse body ! Hi Naomi! You’re right – the desert is so beautiful! I was just wondering if you had any tips/tricks in terms of clothing and nursing in public!! I find it so difficult to wear things which are nursing conducive when I know we’ll be out in public! Do you have any suggestions? I admire you (the couple) so much!! You are very strong to carry your children during the hiking!!! ouawwww Josh two in the same time!!! And finally I WANT a New Balance shoes!!! Hey! I just love your blog!! I also follow your snapchat and I was blown away by the scenery of where yall were staying. Towards the end it looked like a resort of some sort with that amazing view from the pool. Where was that at? I would love to visit someday with my fiance, especially if we end up moving out west!! Very cool pictures! Looks like everybody had a good time there! That desert must be beautiful, one of the trips on my list! Our family loves Zion’s National Park! If you’re ever in Northern CA then you should visit Yosemite. The views are spectacular! If you visit in the Spring the falls are at their peak and stunning. Random question, but…are there any nursing sports bras that you recommend? so fun! we were just there a couple years ago, but at the time i was just pregnant with our now one-year-old!! also, if your still there the narrows is really fun! What a gorgeous place! And, damn! You’re in amazing shape! Ah, my favorite place! Canyon Overlook is one of the hikes we do every time we are there. We just did The Subway in March. Simply beautiful! I can’t get over how gorgeous it is there. I haven’t been to that part of the country in 20 years and I was just a kid then, I had forgotten how beautiful it is. I also am surprised how often Conrad still needs to nurse. It just shows how long it’s been since I had little ones that age. I don’t comment but I felt like I needed to now cos I want to say, “You look really great, Naomi!” And your kids are so lucky to have you and Josh as their parents! Stunning photos- looks like such a cool place to explore. I would love to hear more about your workout routines and what kind of exercise you’re doing at the gym? Thank you for normalizing breastfeeding. And for continuing to over and over. Thank you for nursing without a cover and making it look easy and normal and something that may continue past infancy (BECAUSE IT IS, RIGHT?!) Maybe you already know this, but the main interest or influence to breastfeed comes from seeing it in real life. So thank you. So many women look up to you for numerous reasons but this little one may have the hugest impact on the health and happiness of the moms and babes of your readers. You rock, Namoi. do u have any recommendations cute or cool themed restaurants for sweet 16 or birthday celebrations in general?? Southern Utah is very different than northern Utah! I grew up in Saint George and have loved how you are falling in love with my town and the desert! I went home for Memorial Day weekend and we went to Zion and hiked a bit of angels landing while my siblings hiked the whole thing. I have hiked Angels landing so many times in the past but it’s just too high! Glad you enjoyed Zion!